The historic Town of Morrison is a Home Rule Municipality in Jefferson County, Colorado, United States. The population was 430 at the 2000 census. 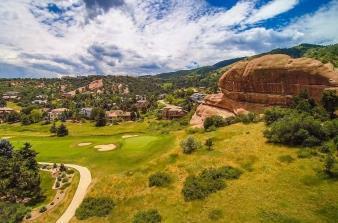 Red Rocks Amphitheatre is located nearby. This small foothills settlement is named after George Morrison (April 16, 1822 June 11, 1895), a builder and businessman who left a mark not only on the town that now bears his name, but on the history of the entire area. A stonemason who immigrated to the Mt. Vernon area in 1859, he helped found the Town of Mt. Vernon and built the Mt. Vernon House, seat of the territorial government under Robert Steele, and an important stop for travelers on the Mt. Vernon Toll Road from Denver to the goldfields of the Rocky Mountains. He became a United States citizen on May 22, 1862. George Morrison later moved south to Bear Creek, where he founded the Morrison Stone, Lime, and Town Co., and in 1874 platted the town that became known as Morrison, or briefly as Mt. Morrison. With Gov. John Evans, he was instrumental in bringing the Denver, South Park, and Pacific Railroad to Morrison in 1874.